I am in the process of building a new website at A Wolfe In The Kitchen – Dishes To Die For which is a cookbook of recipes taken from mentions in the corpus. This cookbook is the brainchild and work of Dorothy Moran aka Inspector Cramer. She compiled the recipes with the valuable assistance of members of the Wolfhounds email list. Many people sent in and tested the recipes, but Dot was the one that spent over 2 years doing the grunt work. 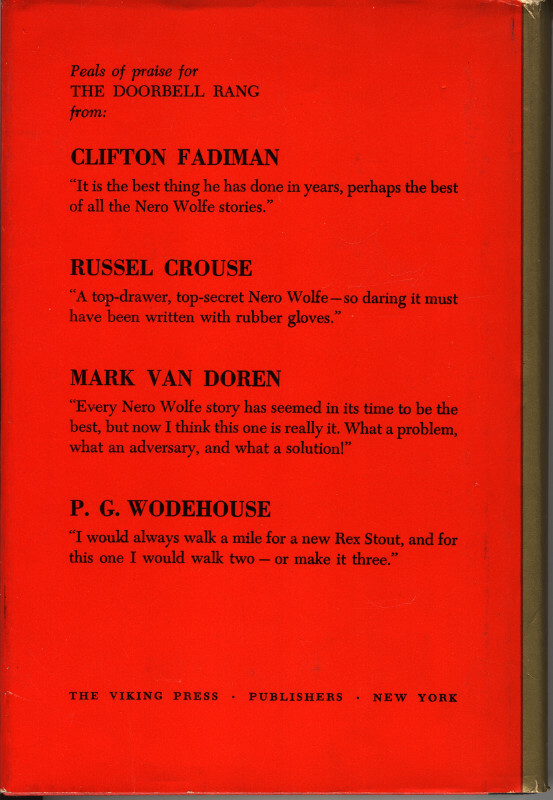 She did all of the compiling and typing as well as coming up with the ideas of the Exotic section, the Melting Pot section, the NY NY section and all the non-Wolfe stuff, in this MASSIVE collection of recipes based on the 47 books/74 stories of the Corpus. 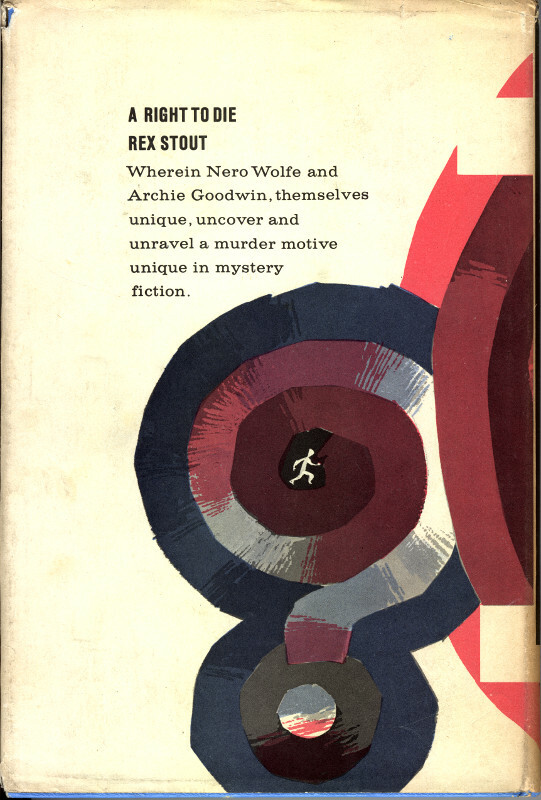 I got involved in this project just recently (July 2015) when I sent her an email in response to one she has sent to the Nero Wolfe mailing list where she mentioned the “A Wolfe In The Kitchen” cookbook. After doing a search on Google and not finding anything there I emailed her asking if it was in print and if so where I could get a copy. She wrote back that there were only 2 printed copies and 1 disk in existence and she would send me the disk if I was interested. After a bit I got another email where she told me that upon opening the box that she thought held 1 print copy and the disk, that the publisher had not returned the disk. She then offered to send me that print copy if I was interested in scanning it. Even then I had no idea just how extensive this cookbook was (though she told me it had around a thousand pages) so I agreed to take on the project. Upon receiving the package and opening it I started to realize what a treasure I held. And how much time it was going to take to get this scanned and back into a format suitable for printing. I dug out an old scanner, installed OCRFeeder (Linux OS here), and got started. I quickly found that the thin paper the pages were printed on allowed the reverse side to show through enough to mess up the OCR software and moved to scanning the pages into GIMP where I could trim the sides off and increase the contrast enough to where the resulting file could be read by the OCR software with only minor corrections needing to be done by hand. I started rebuilding the book in Libre Office and after a few pages realized that it would be more suited to a Website than a print book. I did a rough layout, put up a few recipes, and sent the link to Dot for approval. She liked it and gave me the go ahead and this site was born. It is an ongoing project and will most likely take months, if not years of spare time to complete, so if there are books without links and recipes, please note, it’s not Dot’s fault, it’s just that I haven’t gotten around to getting it scanned in yet. And lastly, I want to say, THANK YOU Dot, for this WONDERFUL addition to the Corpus! AND for allowing me to make it available to all here on the web! 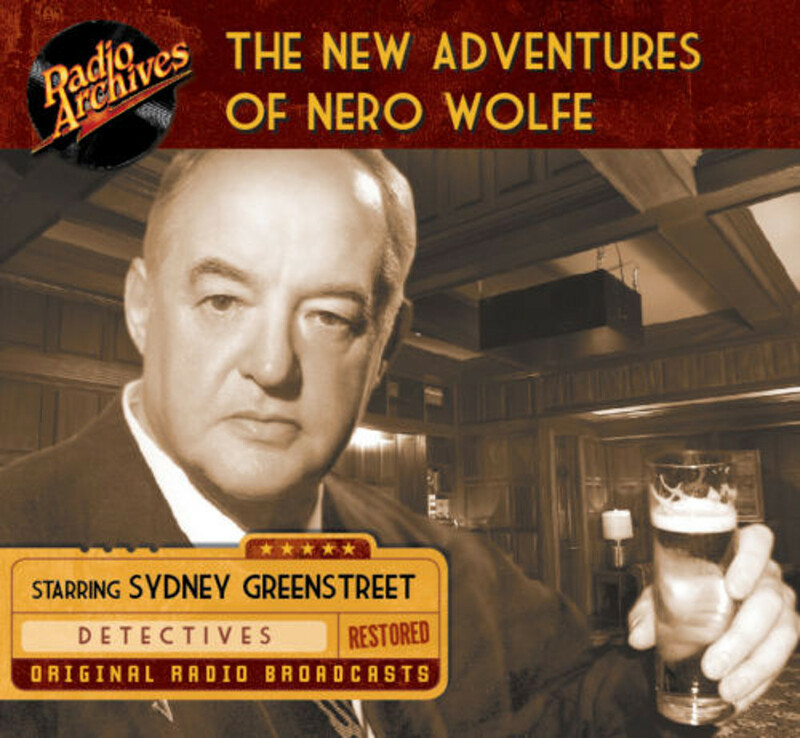 Seth Fidel kindly scanned his copy of the Radio Archives CD cover – “The New Adventures of Nero Wolfe – Starring Sydney Greenstreet” and sent it to me. 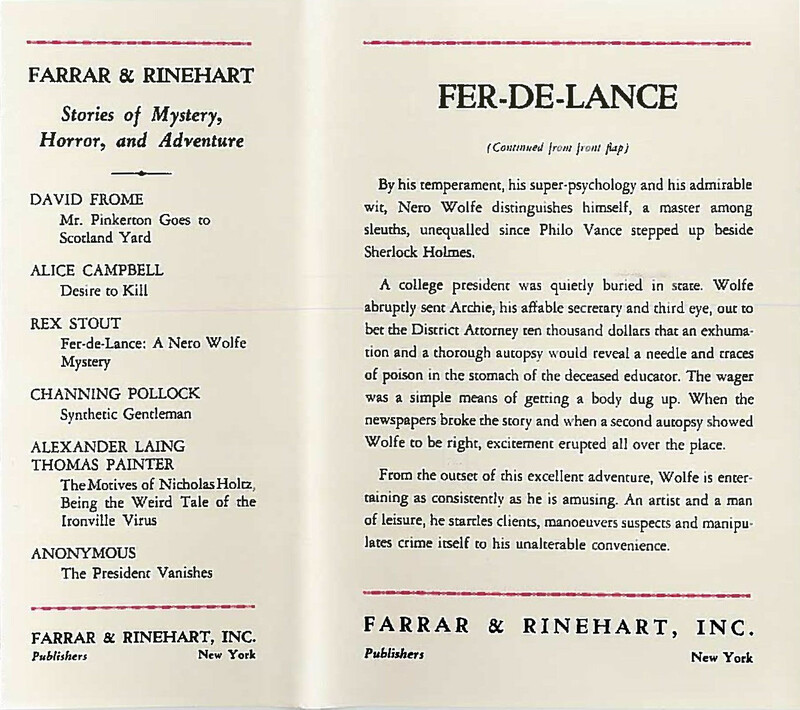 These FER-DE-LANCE cover scans are from Seth Fidel’s Farrar & Rinehart, Inc. (USA) (1934) First Edition Facsimile Dust Jacket. 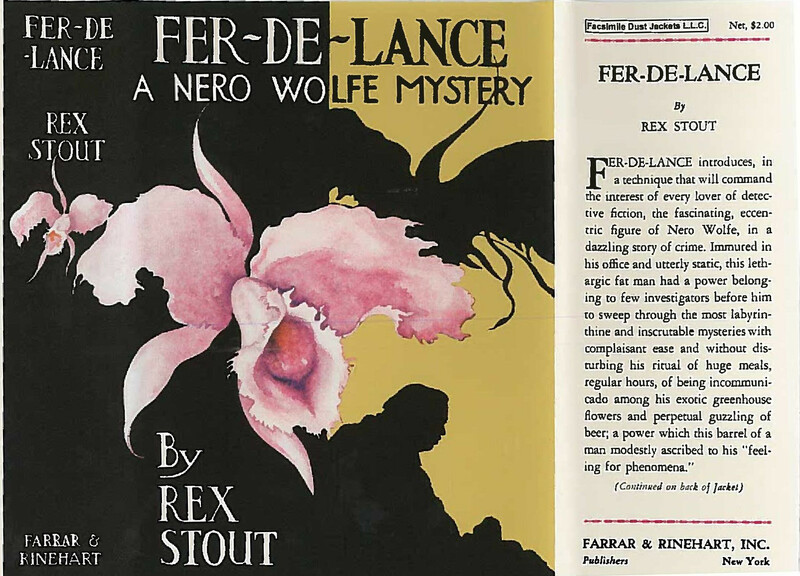 By his temperament, his super-psychology and his admirable wit, Nero Wolfe distinguishes himself, a master among sleuths, unequaled since Philo Vance stepped up beside Sherlock Holmes. A college president was quietly buried in state. Wolfe abruptly sent Archie, his affable secretary and third eye, out to bet the District Attorney ten thousand dollars that an exhumation and a through autopsy would reveal a needle and traces of poison in the stomach of the deceased educator. The wager was a simple means of getting the body dug up. When the newspapers broke the story and when a second autopsy showed Wolfe to be right, excitement erupted all over the place. 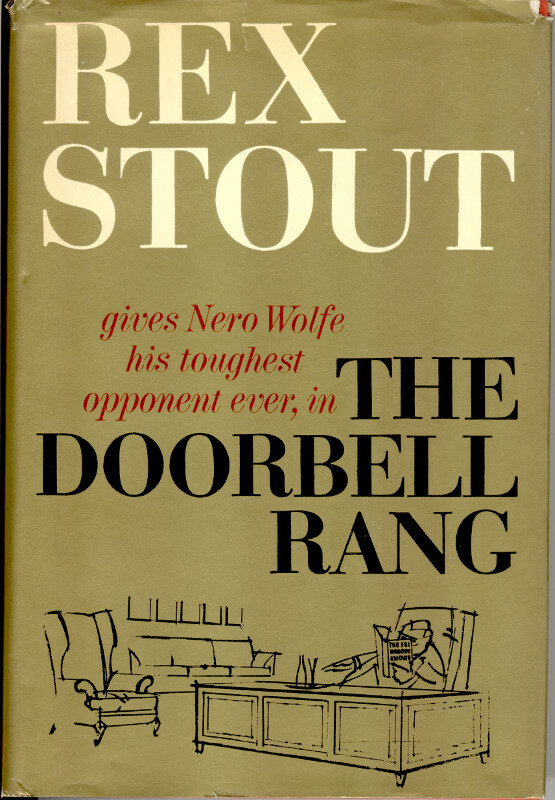 From the outset of this excellent adventure, Wolfe is entertaining as consistently as he is amusing. An artist and a man of leisure, he startles clients, manoeuvers suspects and manipulates crime itself to his unalterable convenience. via Cylindrical, quivering, gelatinous, tinned 12-course meal – Boing Boing. Another new (to me) one. Love the line drawing on this cover. Put the ears on a baking sheet in a 475-500 degree oven for 40 minutes, and then present on a platter at the table with butter and salt on the side. Have your guests shuck at the table. It tastes like cake. You’ll be tempted to cook this at a lower heat or for less long, but I’ve tried it at all heats from 400 to 500 and from 20 minutes to 40 minutes. Forty minutes at 500 degrees is the best. It doesn’t dry out. It’s sweet and perfect. Don’t worry about the cornsilk; it comes easily off the ear after roasting. 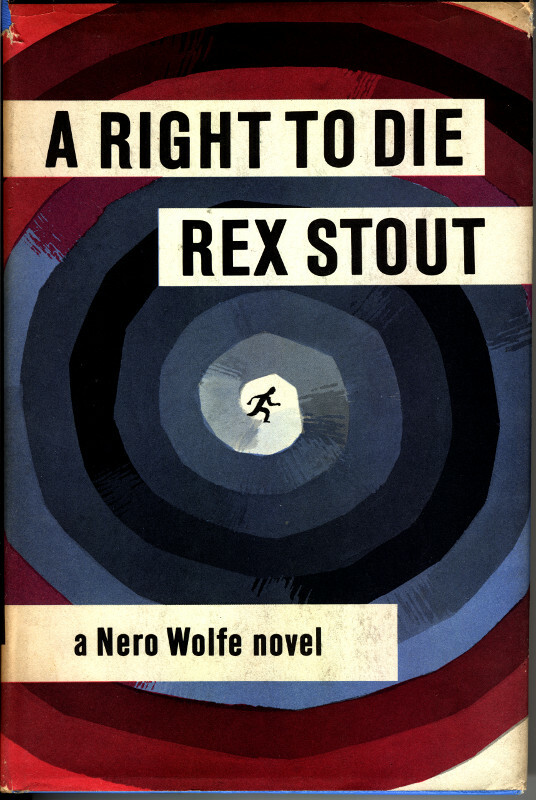 via The Spiral Staircase: The Best Corn on the Cob Ever (a la Nero Wolfe). Been meaning to try this but haven’t gotten there yet. Tis that time of year so must get some and do so.